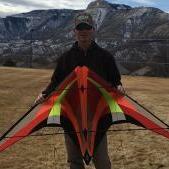 First Flight of the Dark Sunset Fade Kite.. All in all very pleased with low wind performance.. Winds were hovering between 2-3 MPH with occasional gusts of 5MPH. She is definitely a beauty, and looks like she is a well mannered kite. So how many quads do you have now? Thank You, I almost always fly 15" handles. It's just my preference. Had to get out my 15’s this morning. Almost no wind with the Zen. I'd honestly have to sit down and count.. So much has changed since I updated my list last. First of the Gray Fades is starting to come together..Decided to use Black on LE and Black Edge binding to help frame the lighter center section in the finished sail. Since this is one of my earlier panels prior to me adjusting the pattern, I have to decide if I will leave it higher aspect ratio (i.e. shorter vertically) or add a strip of material to top or bottom to bring it to full 1.5 size... Kite is Black, Charcoal, Silver and White. Hopefully I can fly it this weekend weather permitting. LE and Edge Binding is done.. will hopefully finish this kite up tomorrow. Bridle and Frame are all that is left.. 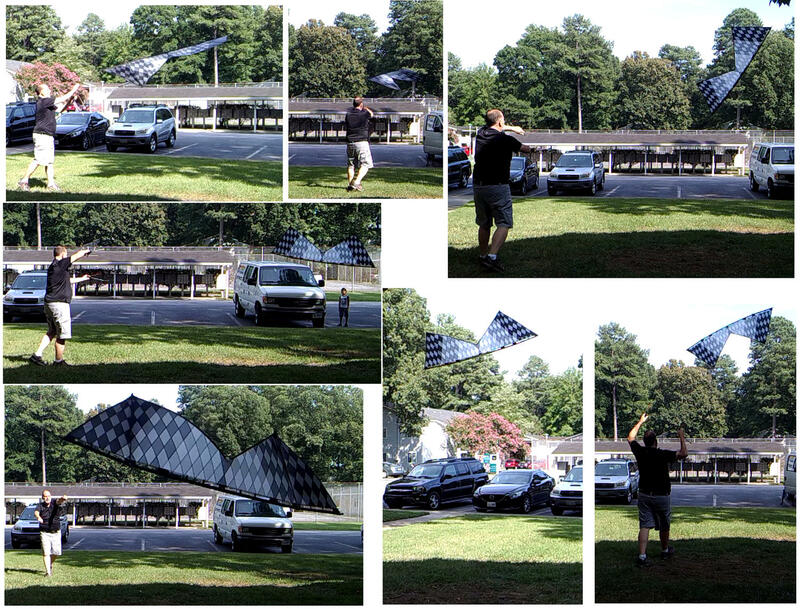 While this kite will use a standard 1.5 LE, I decided to leave it with a slightly higher aspect ratio..
Bridle Test successful. Ready for flight testing. That is a REALLY good-looking kite!!!! More Icarex arrived today.. I was able to get a small amount of both Grape and Plum but no Eggplant. Some of the classic purple shades are nearly impossible to find these days.. Combining those two with a few strips of Eggplant I have left from the scrap bin and some Purple ought to give me a nice gradient fade for a purple kite. A new Purple Dark Fade and a 5 or 6 color sunset fade are in my head right now.. I'm completely out of seam tape so nothing to cut or mock up yet.. I also plan to add the Midnight Blue Challengemax Poly into another kite like on the original Diamonds kite.. I assume it's because of the smaller ripstop grid, but it refracts the light differently and I should be able to get some shimmer patterns if I do this right. I meet riffclown at jockeys ridge state park on Saturday. He was willing to drive a hour and a half to meet a fellow flyer! What a great jester. Day started with winds in the zero to 1 mph range. I tryed the smaller b2 size first on 13" handles and 50' lines, found it was too light of wind. 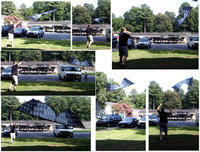 But then put the hive on a set of 120' line and 15" handles, and the kite was amazing and the wind picked up to 1 to 2 mph. Riffclown's work is amazing and a tremendous flyer as well. As the day progressed we had the winds pick up and I became more comfortable flying. Yes I know I a guy who could fix the kites but I still am a very careful although the kites are built for a bearing. The added reinforcement at critical places really make a difference. The kite is a little heavier on the lines but saw some amazing glides in the slightest breeze and with time I know I can do the same as well, as I have the proper equipment (kite) to do so. So dont believe by first looks and believes that it's a heavy kite it is not. The kite is constructed to complement the added weight, with the construction of the sail. Hope I did ok for my first review, anyone have any questions please ask! @atbflyer Thank you ever so much for the kind words and review... Enjoy those kites.. Okay I'll ask a silly. What's a half kuk1? Nice review. @Breezin I took as a nice compliment from context. I did to. Just don't know what it means LOL. Started a colorizer for my Diamonds..
Will be pretty rudimentary compared to the Djinn work from Watty. A quick sample of some of the pre-art going in place for this..
10 more yards of Icarex along with materials for 15 frames ordered today..
As far as I know, I don't have an off button.